The word Tikka means chunks, pieces or bits. Chicken Tikka Masala is a delicious North Indian dish in which pre-marinated pieces of chicken are grilled and then added to a thick creamy gravy. The result is a lovely smokey flavor. You can cook and freeze this dish quite well or marinate the chicken ahead of time and also make (do not add the cream) and freeze the sauce beforehand. When you are ready to serve, just grill the chicken and heat through the gravy, add the cream and mix the chicken and gravy, then serve. 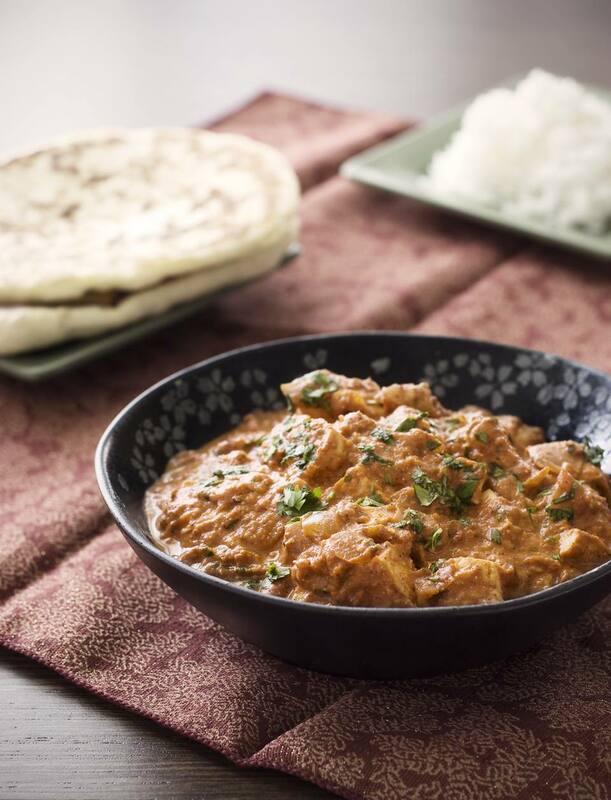 Serve Chicken Tikka Masala with hot Naan (leavened Tandoor-baked flatbread). Grind the chopped coriander (keep some aside for garnishing) and all other marinade ingredients (except yogurt) to a smooth paste in a food processor. Pour the above mix into a large bowl and add yogurt. Mix well. Add the chicken pieces and mix well. Cover the bowl and refrigerate. Allow to marinate overnight. Preheat your oven or grill to medium-high (200 C/400 F/Gas Mark 6). Place the skewers on the grill racks in your oven with a tray underneath to catch drippings. Roast open till the chicken is browned on all sides and tender. Keep aside. Heat the oil in a deep pan on a medium flame and add the onion. Cook till soft. Now add the cardamom and the garlic. Fry for 2 to 3 minutes. Add the grilled Chicken Tikka (chunks/ pieces) and stir. Cook for 10 minutes. Add the cream and mix well. Turn off the flame. Garnish the dish with chopped coriander leaves and serve hot with Naans. Make a small bowl out of aluminum foil and place on top of the cooked Chicken Tikka Masala when it is cooked. While you are cooking the curry, burn a golf ball-sized lump of coal till red hot. Place this piece of coal in the foil 'bowl' and immediately cover the chicken dish. Allow to stand for 5 minutes. Uncover, remove coal and foil 'bowl', garnish Chicken Tikka Masala and serve.